Panaji or for that matter entire Goa state is a place where the cultures of east and west seamlessly fuses together to bring forth a very unique cosmopolitan culture. Such a cosmopolitan and unique culture in fact doesn’t exist in any other part of India. We mean where else, apart from Goa, will you find women completely covered in Indian conservative sarees and ironically at this very same place you’ll find women in modern swimsuits enjoying alongside beautiful beaches. And it is probably only in Goa where grand Christmas celebration will make you feel that you’re enjoying Christmas in a Catholic European country. And of course one cannot also forget to mention the overwhelming popularity of football here is in complete contrast of amazing popularity of cricket in rest of India. Below we’ve mentioned some other important cultural aspects of this beautiful place, which again reflects how Panaji city and rest of Goa effortlessly bridges together the culture of east and west. 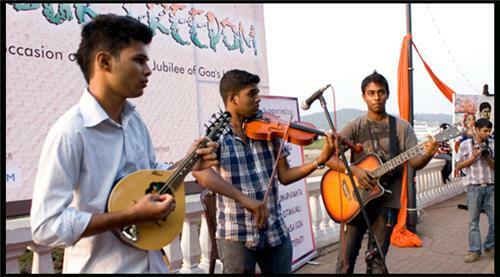 Goan people simply love music. And in music too Goa brings forth a very unique diversity. Here traditional Indian classical music thrives alongside local Goan Konkani songs. While importance of traditional Indian music in Goa can be gauged from the fact that legendary Indian singers like Lata Mangeshkar, Asha Bhonsale and Kesarbai Kerkar had harnessed their singing skills in this very state, but it is the Goan Music that is actually integral part of Goa and Panaji’s culture. It has been part of Goa’s culture for 400 years. Actually it is one of the priceless gifts of 400 years of Portuguese legacy and continues to thrive even today. In Panaji and also in rest of Goa, for every happy occasion there is a Goan song. Marriages, engagements, birthday parties or for that matter every happy occasion is still celebrated with Goan music. This is particularly true about Goan Catholic community, as they have inherited much of the values of Portuguese legacy. As for what goes into making of Portuguese music, then it is a beautiful fusion of European music and Indian music. While the feel of European music is brought forth by western instruments like Piano, Violin and Mandolin, instruments, the Indian touch on other hand is brought forth by konkani Language. 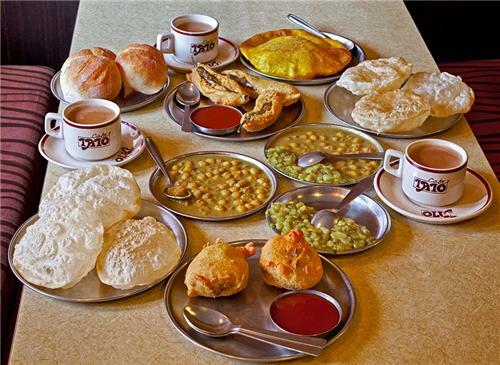 Food and cuisine equally expresses culture of any place or state. And people of Goa surely have all the right to be proud of owning a unique cuisine that is again one of its kind in entire India. After all, which other Indian cuisine offers foodies the pleasure of eating fish curry and rice along with chouricos (a kind of Portuguese sausages). In fact the entire Goan cuisine is again unique combination of Indo European Cuisine. With European cuisine obviously bearing rich legacy of all the rich spices and unique European dishes introduced by Portuguese during their rule. Goan food is also very unique for its rich sea food, with fish being a part of Goan people’s basic and daily staple. Goa’s beautiful coastlines and beaches has indeed given its cuisine unique advantage of enriching its cuisine with amazing sea food dishes. Any mention or talk of Goa’s culture would be incomplete without paying rich tribute to its amazing religious harmony. After all, there are not many places in India where Ganesh Chaturthi and Holi is celebrated with as much fervor and passion as Christmas. In fact in Goa Christmas is celebrated in such a grand way that its colorful celebration attracts thousands of tourists from all across the world. This unique harmony that Goa brings forth between local Christians and Hindus does make its culture very vibrant and colorful. This is another unique cultural specialty of Goan people. While rest of India is crazily mad for cricket, Goa on other hand is mad for Football. Football is indeed deeply entrenched in the cultural DNA of Goan people. It’s a priceless gift that Goa has received from its innumerable beautiful beaches. 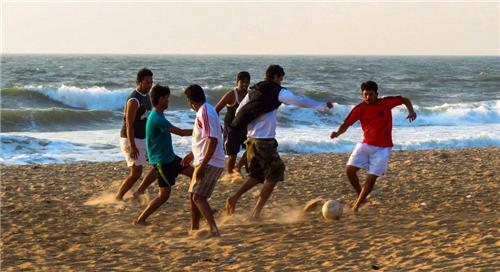 As where there are beaches, football is invariably popular and Goa is obviously no exception. Some of the most successful Indian football clubs including Salgaocar Sports Club and Dempo Sports Club are based in Goa and not to forget that many of great football players from Indian national team also come from Goa.